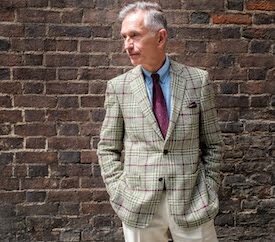 I've shown H. N. White's ties here and on Instagram before, but when my eye was caught by his current collection made from vintage Huddersfield wool cloths I had to mention him again. "I started my tie company around 18 months ago. I wanted to create fully handmade English ties using interesting and unique British fabrics. This is primarily what we sell: some fabric, such as grenadine comes from Italy and our knit ties come from Germany (as there only a couple of places in the world that make knit ties, Britain is not one of them). 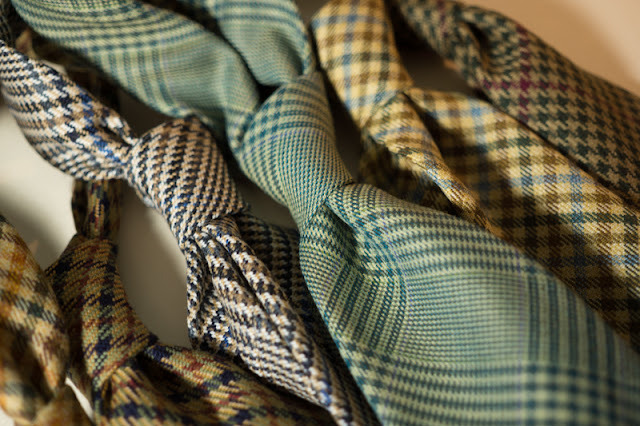 In the past we've made ties from Irish linen, Fox Bros flannel from Somerset, woven silks from Sussex and the mainstay of our collection which is printed silk from Macclesfield including Adamley. This particular crop of Huddersfield wool I was lucky enough to chance upon through a contact who had a stockpile of some rather old English woollen fabrics. So they are actually vintage, rather than chosen from current bunches. Most were woven in single width which is around 70cm width which gives a clue to its age. Most modern woollens are woven at 1.4m wide now. I picked what I thought would translate well into a tie - Prince of Wales and gun club [checks] are particularly popular - and of course the weight must be not too heavy so that is also a factor when choosing fabric". 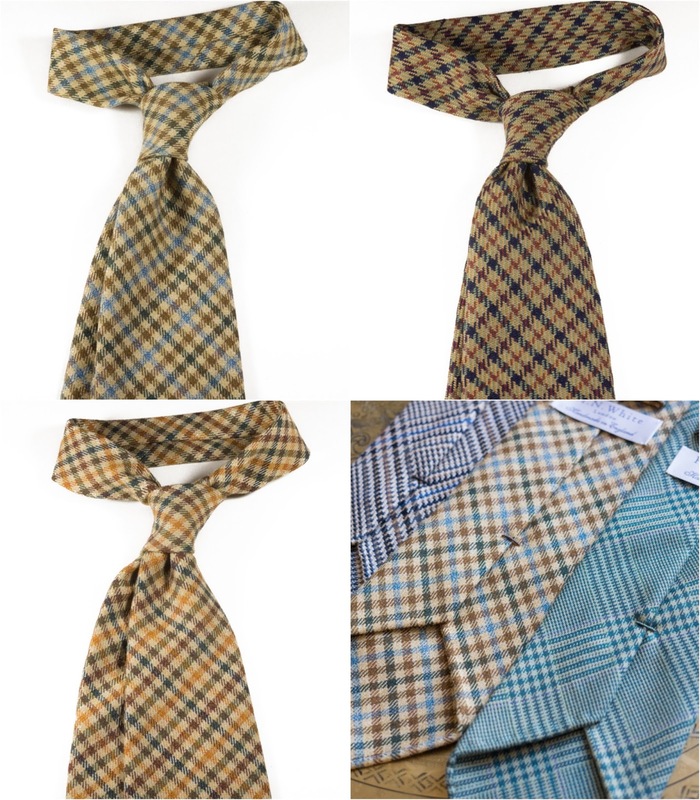 To see more of Harry White's ties click here for his website. This post is unsponsored and all views are mine alone. All gorgeous! I am very tempted by these. They are beautiful indeed. Nicely made. And the vintage cloth only adds to their beauty. Thanks for the article, David. Thanks for the article, David. These ties are really beautiful. They have that muted elegance I especially like. And the vintage cloth only adds to their beauty. Quote a bad experience of having paid for a tie that has still not been received 11 days later. The mail received when you pay says the company send a communication when the tie's shipped, that hasn't arrived yet. There is no number to call and the responses requesting feedback are sporadic and. when it catches the founders fancy. Thw order was supposed to have been despatched (per Harry's mail) but no tracking number has been provided. Makes you wonder what the shipping cost's for if it can't be sent by tracked mail? Sadly I still await feedback from the founder and NO I haven't received what i've paid for, and continue to hope he sends it or atleast has the courtesy to return the payment! I am having a similar experience to the above correspondent, having paid for a number of ties but not having received them. Does anyone have a telephone number for this company? Thanks Anon commenters - if you're still having problems can you email me. I'm not keen to support suppliers with poor customer care, but I rarely know that's the case unless I'm told about it. I've spoken to HN White who knows of no outstanding issues. The comments are anonymous and unless I'm contacted directly I can do no more to help. Meanwhile all concerns should be addressed to HN White whose contact details are clear from their website.